On my radar are trend bytes – a gathering of observations – that indicate a larger trend is at work. I had the pleasure of reading and reviewing the book The Life Changing Magic of Tidying Up by Marie Kondo for a boomer-focused blog. It’s a hot trend right now. In my research I consistently hear older adults say that they have a lot of stuff. They tell me it keeps them from moving and “rightsizing” their living situation. They say it makes them depressed. Most of all they tell me their kids don’t want their stuff! After hearing about the Kondo method on television, I thought I’d check it out. I tried it in my own house (and am continuing to use it)! It is freeing to rid yourself of things you no longer wear or use. Just this week, I was sitting in on a focus group for my latest project and heard of a twist on this idea. When asked about their passions, one woman in the group said she was really excited about “death packing.” She went on to describe a process similar to Kondo’s but is about gradually getting rid of things so that your loved ones don’t have to. The process, called Death Cleaning, is Swedish. The Swedish word is dostadning. It means slowly decluttering your life until you die; it generally begins in your fifties and is done so no one else is responsible for your leftovers! There is also a book about it by Margareta Magnusson, titled “The Gentle Art of Swedish Death Cleaning: How to free yourself and your family from a lifetime of clutter. We have a television show called Hoarders: Buried Alive and consignment shops have successfully sprung up across the nation. In some cities, there are waiting lists for self-storage units, even though there are 50,000 storage facilities in the U.S. — five times the number of Starbucks. That’s 2.3 billion square feet. The backyard shed business is a lucrative one – 25% of people with two-car garages can’t park a car in one. We use eBay, craigslist, and NextDoor to unload things. “For the first time in history of the world, two generations are downsizing simultaneously,” referring to our oldest population and the boomer generation. 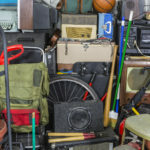 With the youngest of the boomer generation in their mid-50s, there are years of opportunity ahead for companies who can help people plan, organize, store, and get rid of their possessions. I wrote about this trend for MediaPost a year ago and heard from many people going through this with their parents. There are high tech and no tech solutions here, some with very little start-up cost for the solopreneur. What do you think about the issue of being “over-stuffed” and the idea of death cleaning? I would love to hear from you!